Last month I shared with you the Squat Challenge. Did you try it? I did it up until the last couple of days, just because I was and still am sick. I am going to stick to the squat challenge again this month. I love it! I can feel it in my legs and calves, so I know it’s working. 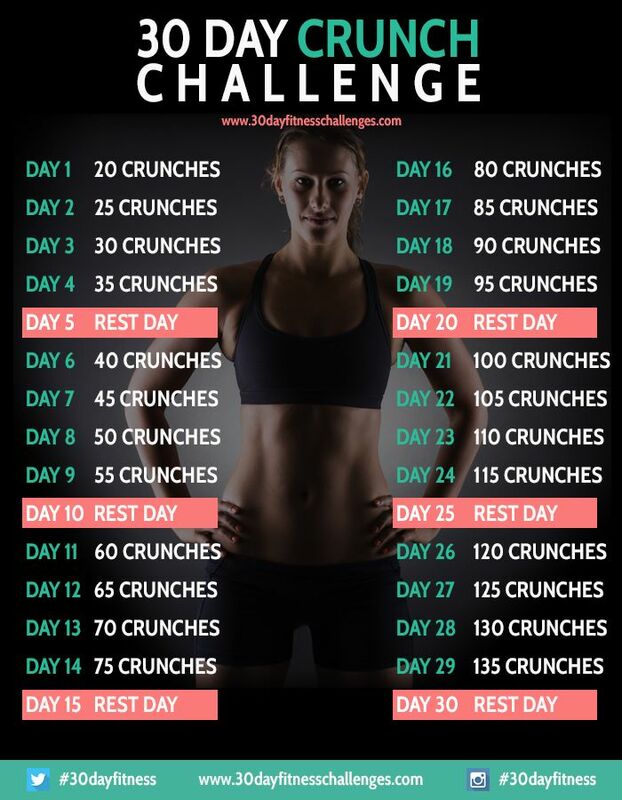 Now that we are into a new month, I thought it would be great to share with you another 30 day challenge, the Crunch Challenge. I think crunches are a fairly easy exercise and if done properly, you will feel it in the abs. Since summer is creeping up on us pretty quick, nothing like toning the abs for summer tank tops and bathing suits. I am so dreading bathing suit season. Ugh! Believe me, my abs could use some serious work! While doing this challenge, I highly recommended upping your water intake. It will help with bloating, help lose weight, hydrate you and heck it’s just good for you. So try to get in your 8 cups a day! Lie down on the floor on your back and bend your knees, placing your hands behind your head (don’t lock your fingers together) or across your chest. Slowly contract your abdominal, bringing your shoulder blades about one or two inches off the floor. To keep your neck in proper alignment, place your fist under your chin to keep your head from moving. Keep your back flat against the floor throughout the entire movement. Remember if you have any pain stop doing the exercise. So are you you going to join me for this months challenge? Why not try to incorporate the Squat Challenge with the Crunch Challenge. You will feel it and you will feel great! These are just tiny ways to help get your body moving! Have fun with the challenge and try to get a friend to do this challenge with you! Maybe make a fun wager? I got the Crunch Challenge from 30 Day Fitness Challenges. You can check them out for more 30 day challenges. Have a super great Sunday! I am hoping to be better tomorrow so I can get some food recipes up on my blog this week. Yikes 135 squats. That’s a lot. I might have to try your challenge. I hope you feel better.